This Semi automatic sealing Machine are a user friendly and high speed-packing machine with no labor work involved for sealing or take off. The products is placed in the in feed conveyor from where it moves on to the sealing area with the help of fractional power motors. For the purpose of making the finest Horizontal Band Sealer available to our clients, we engage in the utilization of high grade raw materials and modern machines, in compliance with the set industry norms and guidelines. Because of this, the offered range is known to have a superior performance, commendable resistance to corrosion and a longer functional life. Our organization is engaged in providing the multiple types of machinery for the industries. 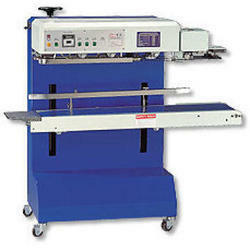 We offer Vertical Band Sealer for the packaging purposes. 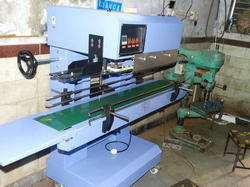 Band sealer machine is made of premium quality materials for optimum utility and accuracy in application. These can be customized as per the needs of the client and are known to have long performance life. These products are widely used in various industries and sectors for diverse applications. These are available in various sizes and designs at most competitive prices to fulfill their exact requirements and demands. We offer them with quality material to ensuring defect-free delivery of products to our customers. 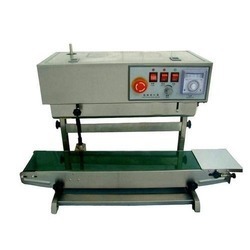 We manufacturer & export premium Foot Impulse Sealer worldwide. Our auto sealer machine is perfect for pouch sealing of all the pouch BOPP, PP, LD all pouch, including aluminium foil. It perfectly seals 1/2kg to 25kg tea, confectionery, powder, wafers and snacks. This machine can be operated both manually as well as automatically. Foot Impulse Sealer assists in speedy production and requires very less maintenance. Accurate sealing of pouch packing machine like tea, confectionery, wafers, snacks, powder. Looking for Semi Automatic Sealing Machine ?